We are committed to living locally and sustainably, minimizing our carbon footprint, rearing animals with compassion, and caring for the land. We run, in a somewhat chaotic manner, a small family-friendly campsite. We are very small and like it like that. Many of the people who come to our site have been coming for decades and now their children are bringing their children here – we like that as well. 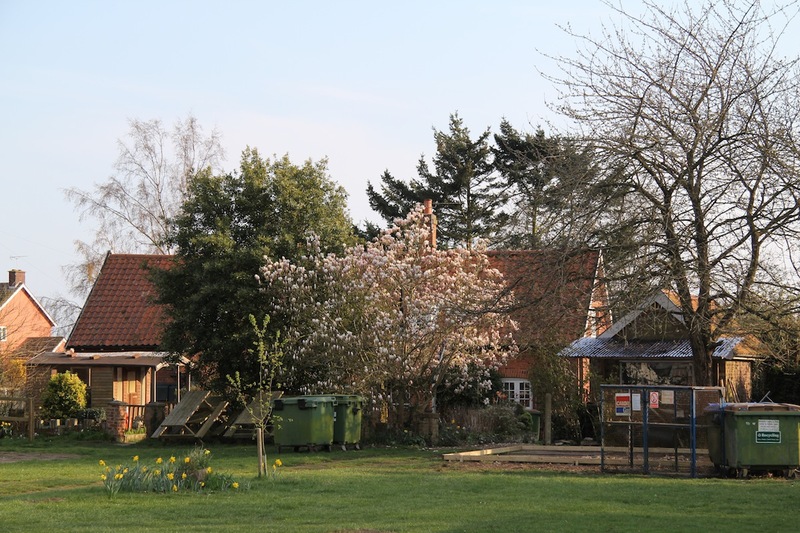 While we do have people coming from far away – lots of lovely people come every year from the Netherlands some on bicycles – we also have lots of people who come and camp from neighbouring villages. The award for the shortest distance travelled goes to someone from our own village, Shottisham – how cool is that? 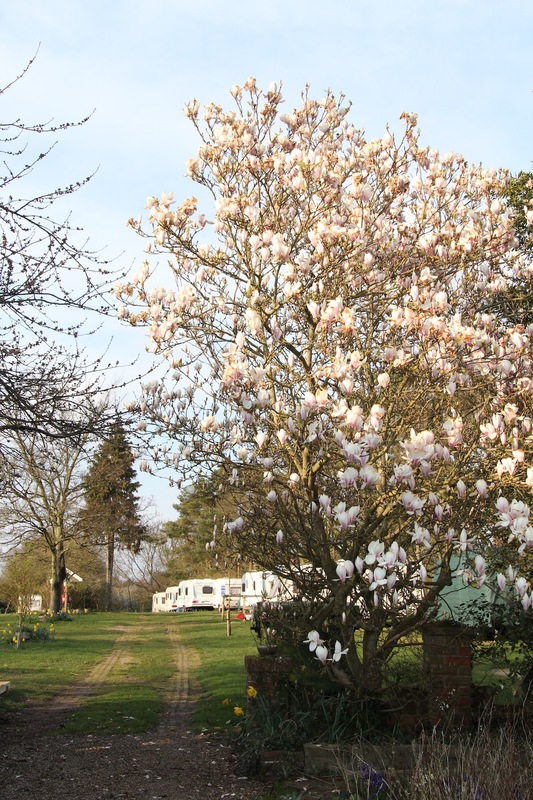 The site is very basic, natural and laid-back – it is a place to relax. We think that small, local, considerate, ethically-responsible businesses are good. 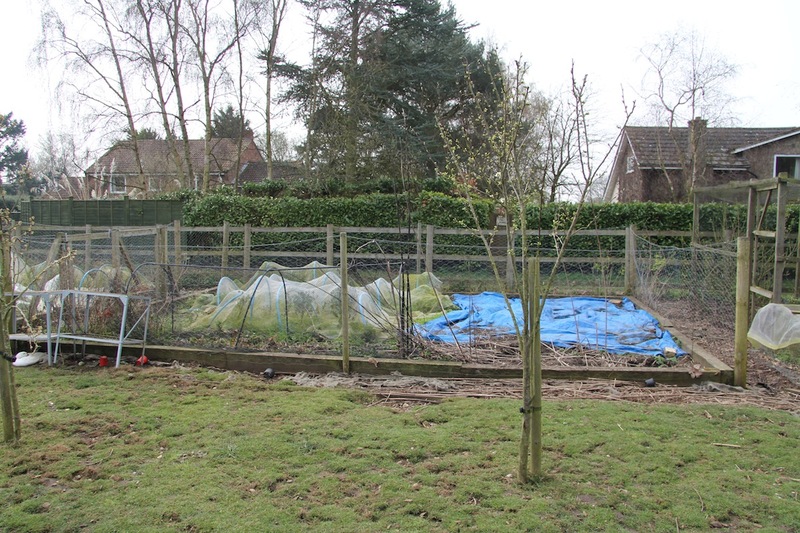 We grow our food, rear our animals and manage the land in accordance with organic principles. 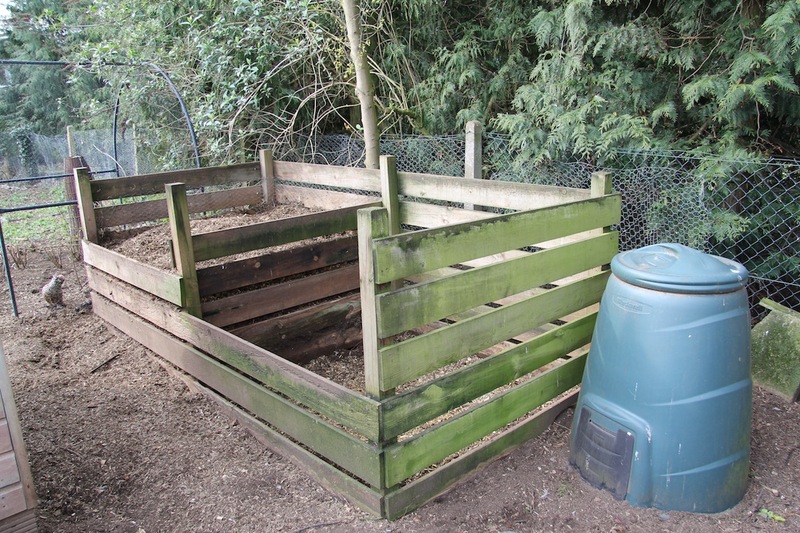 We don’t use pesticides or chemicals (hence all the weeds) we use home-made compost, chicken poo (we have a lot) and horse manure (from someone who keeps horses 300 metres up the road) to add nutrients (+ some organic tomato feed and seaweed). We don’t use antibiotics on our livestock and we feed Hi-Peak organic feed, although we want to work towards being able to rear our animals only, or mainly, on pasture where possible – we might need to rent some land to do this successfully though.. We like to think that all the weeds, patches of stinging nettles and generally uncultivated areas are there to encourage biodiversity rather than simply because we haven’t the time to keep everything clean and tidy. We use green cleaners and recycled toilet paper in our home and on the campsite. We try and avoid supermarkets – we buy our cleaners and also bulk stables such as rice, flour and beans from Rainbow Wholefoods. We have recently been awarded the Suffolk Carbon Charter – Gold. 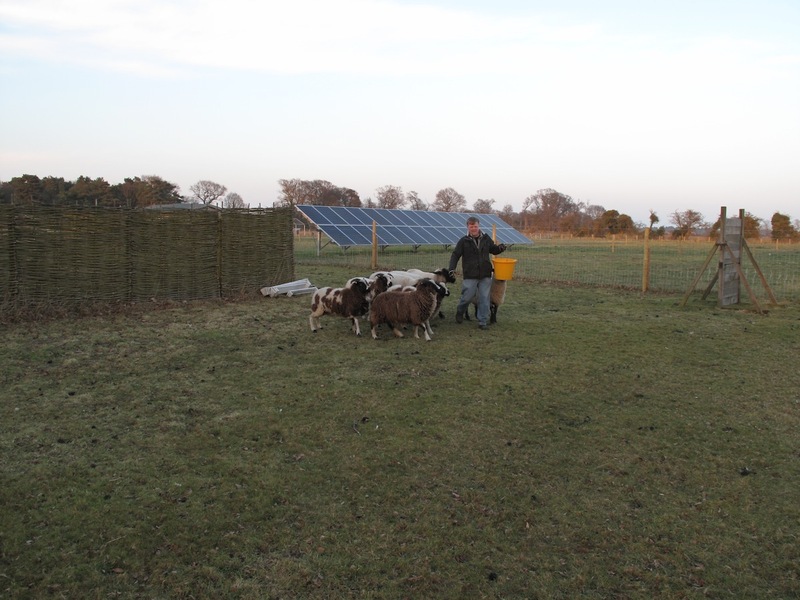 We have a photovoltaic array in the sheep field that provides much of the electricity for the site and house. We are also hoping to install a biomass boiler to provide hot water and heating for our new toilet block and house in the next year or so. PV array in the background – possibly our only wise business decision! Life: We want to raise animals in a humane, natural manner. 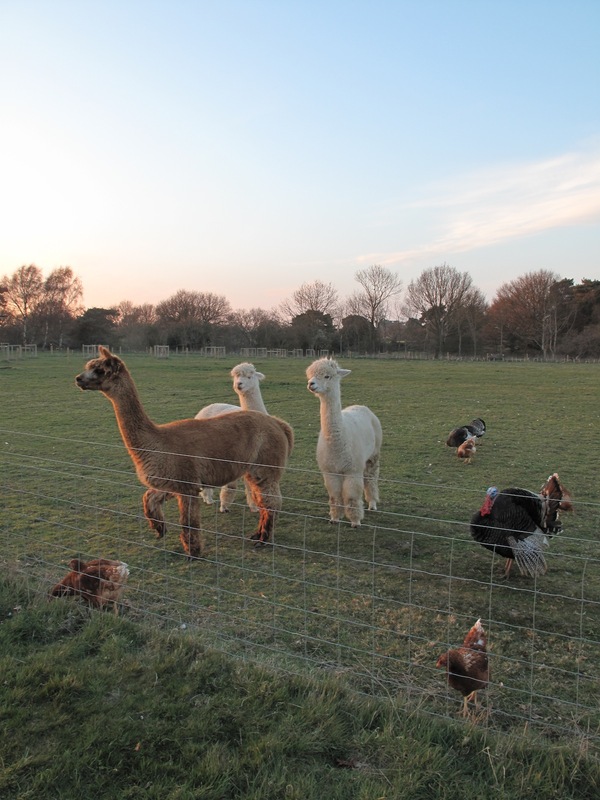 Our poultry free-ranges (we have caged in our vegetable plots not the hens), our sheep and alpacas hang out in their fields and the pigs are kept on pasture. In the longer term we hope to rent some land nearby so we can give our pigs more space and they can forage for more of their diet. We believe that our animals have the best possible life, doing what comes naturally. We avoid, or minimise, any suffering or trauma. We generally eat very little meat as we believe a largely vegetarian diet is better for the world and for us. When I do eat meat it is only meat that I know has had a good life and a quiet, stress-free death – so basically meat we raise ourselves. And death: The death of our animals is very important to us and something we have considered a lot. All of our animals are used to being handled to reduce stress at the time of slaughter. We are permitted to kill poultry for our own consumption on the small holding. We both find killing our animals very stressful, but realise that it is a consequence of eating eggs, drinking milk and eating meat and we want to take responsibility for it. We take the chosen bird to a quiet place, put it in a cone and then stun it using this. James did a lot of research and concluded that this method of stunning was the most humane way to dispatch poultry. The stunner was very expensive, but for us, this is the cost of meat/eggs. We then cut the throat of the bird. James does the stunning and cutting and I hold the legs of the bird. The hens that live in the fruit garden and roam around the site have a pension policy – we do not kill these (unless they are suffering). Our new hens ranging on the small holding are not quite so lucky and don’t have a pension policy. We plan on keeping these for two years and then killing them. They will then be fed to our dogs (they eat a raw food diet). 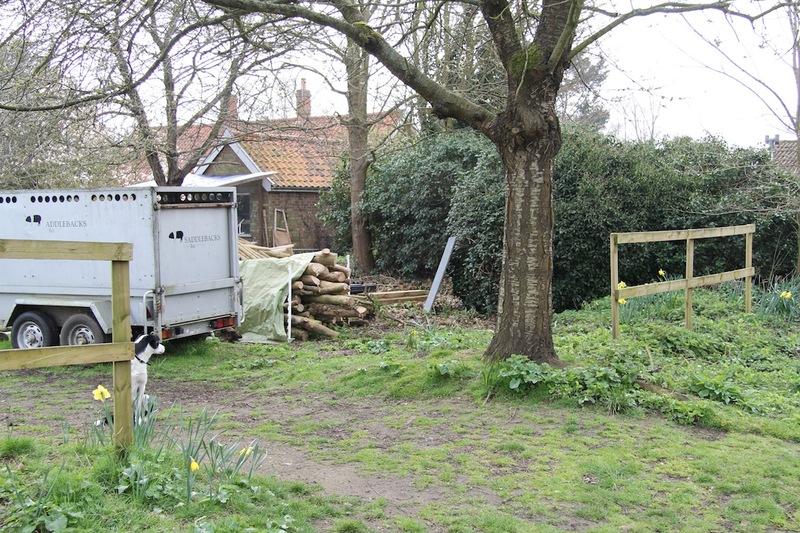 This will make our small egg business slightly more financially viable and will provide food for the dogs. The hens will have lived a good life and as I am pretty sure they don’t have long term plans or ambitions so won’t be missing out on much. We cannot kill our sheep or pigs on our smallholding so we have to take them to an abattoir. We use a small local abattoir linked to a butcher shop less than an hour away: Ruse and Sons. They are a fantastic butcher and abbattoir. Before we took our pigs there the first time we spoke to the slaughterman who walked us through the process. They generally only kill on Mondays and slaughter their own animals for the butchers and some animals from local small holders and small farms. The whole operation is clean, calm and thoughtful. The abattoir is behind the butchers on the main street of Long Melford in a residential area. We take our animals there very early in the morning and the animals don’t have to wait for long at all. We waited for our pigs to be killed last year (I wanted the blood) and they didn’t seem distressed at all. The pigs slept in the trailer the night before and only woke up when we got the abattoir. As they were used to people they were generally curious about what was going on. As there were only a few other animals there (less than 10 or so) there was no hysteria and we stood outside while the deed was done and we didn’t hear any frightened noises. To be honest, if the process hadn’t been good, I was going to have to become a vegan as if I can’t eat my animals who have been raised humanely and had the best possible death then I can’t really eat someone else’s! We are (well I am) very committed to the nose to tail principle as exemplified by Fergus Henderson in his restaurants and his books. I also like Odd Bits: How to cook the rest of the animal by Jennifer McLagan. We therefore consume every bit of our animals – as far as possible. 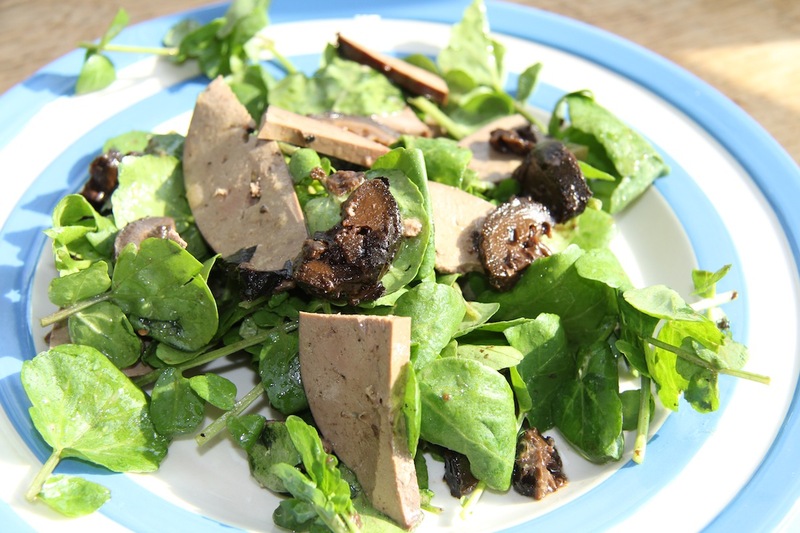 I use the blood to make black pudding, we share the offal with the dogs – we have roast heart, devilled kidneys, liver salad and terrine, and they get some cubes of liver as training treats – they will do an awful lot for some liver. Pigs heads get made into brawn, trotters into wonderful trotter gear for use in Fergus Henderson’s recipes; the bones, lungs , poultry feet and heads, intestines and other odds and ends get gobbled up by the dogs. When we kill our wether in a month or so I will experiment with making haggis. Our long term aim is to try and sell compassionate meat on a very local, very small scale. 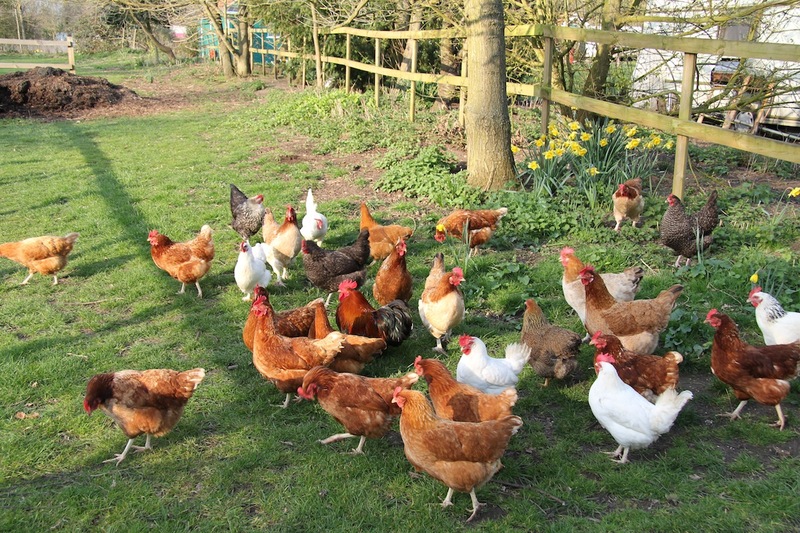 We would like to raise our own poultry (hens, turkeys, geese and ducks) in a free-range, organic manner, kill them on site and sell them at the ‘farm-gate’ so other people have the opportunity to buy meat and eggs raised humanely. We also want to start keeping sheep and goats for milk and to make ice-cream and cheese. We currently get raw milk for our own consumption from the Calf-at Foot Dairy . We plan on making our own cured and smoked meat, and sausages from the pigs in the near future. oh my god, I’m worn out just reading about all that it takes to have a holding as you do. Perhaps if I ever can visit I will see it’s just part of life and not ‘a lot of work’. I think you both are amazing and am so enjoying the blog and photos. Thank you for putting the effort in to this. I very much appreciate your descriptions of the deaths of the animals you raise. I think of this all of the time but sometimes it seems like the lives of what we choose to eat seems so far out of our control. Whether it be greens or pigs, I want to know the life and death history. It’s not just about being concerned about what goes into my body, but having a compassion for all living things, for our planet, for those humans and animals that come along after we’re gone. I appreciate the great steps you take in raising this food… I wish you were my neighbor and I’d come by from you! I do find some gems like you here in the USA. It’s good you blog… thanks! Thank you for your kind comments. If you were my neighbour, I would love to visit your wonderful dogs and learn about the Iditarod race.